On October 3, 1954, a teenage Elvis Presley made the drive from Memphis to Nashville to make his one and only performance on the Grand Ole Opry. Debuting his high-energy brand of rockabilly with "Blue Moon of Kentucky" it was his first live performance on national radio broadcast. He had just recorded his first record at Sun studios, That's All Right just a few weeks prior. 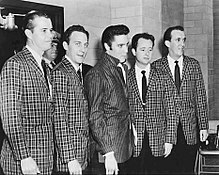 An afternoon in 1955, the Jordanaires played a show in Memphis with Eddy Arnold to publicize their new syndicated TV series, Eddy Arnold Time (for the program the group used the name Gordonaires). They sang "Peace in the Valley", and when the show was over, Elvis Presley, an emerging singer, talked with them and said, "If I ever get a recording contract with a major company, I want you guys to back me up." He was on Sun Records at that time. "Have You Ever Been Lonely (Have You Ever Been Blue)?" The group changed again in 1982, when Hoyt Hawkins died. His replacement was Duane West, formerly of Sonny James' backup group, the Southern Gentlemen. In 1990, the group provided backing vocals for Presley's former Sun Records labelmate Johnny Cash on his Mercury Records album Boom Chicka Boom. The group has also cooperated with Vikingarna. The lineup remained constant for the rest of the decade, with West leaving due to an illness in 1999 and his death in 2002. His replacement was Louis Nunley, formerly of the Anita Kerr Singers. Neal Matthews died on April 21, 2000. He was replaced by new lead Curtis Young. The Jordanaires performed with many modern recording artists as well as recent sessions with country musicians. 1975: Gary Stewart's RCA debut Out of Hand, that spawned three top ten hits including the "She's Acting Single"
1999: began their collaborative work with Art Greenhaw, which resulted in a Grammy Award for Best Southern, Country or Bluegrass Gospel Album for We Called Him Mr. Gospel Music: The James Blackwood Tribute Album (2003), and six Grammy nominations for Best Album of the Year in a gospel category for other album titles, including The Great Gospel Hit Parade (2001), God Is Love (2002), Always Hear The Harmony (2004), 20th Century Gospel (2005) and Southern Meets Soul (2006) AllMusic noted about the 20th Century Gospel album that "Greenhaw's manly baritone is warm and inviting, and when backed by vocal-group legends the Jordanaires ("Gospel Woman," "Welcome to My World"), the resultant sound suggests the glory days of Elvis Presley and Jim Reeves." ^ "Opry Timeline – 1940s". Opry.com. Retrieved July 6, 2012. ^ a b "The Jordanaires". AllMusic. 2012. Retrieved July 6, 2012. ^ "Jordanaires Biography". Cmt.com. Retrieved 11 May 2011. ^ Graham, Charlotte "The Jordanaires" (February 22, 2003), The Clarion-Ledger (Jackson, MS), "Religion," p. 1E. ^ Cox, William L. "Patsy Cline's Recording Sessions - The Decca Years". Patsified.com. Retrieved 7 September 2018. ^ Linda Hjertén (22 January 2004). "Vikingarna tar farväl av fansen". Aftonbladet.se (in Swedish). Retrieved 14 December 2016. ^ "Hugh Jarrett". Jordanaires.net. Retrieved March 28, 2013. ^ Cooper, Peter (March 27, 2013). "Jordanaires leader Gordon Stoker dies". The Tennesseean. Retrieved June 2, 2013. ^ Lewry, Peter; Goodall, Nigel (1991). Cliff Richard The Complete Recording Sessions 1958-1990. London: Blandford. pp. 62–63. ISBN 0-7137-2242-8. ^ "Hard Line - The Blasters - Songs, Reviews, Credits - AllMusic". AllMusic. Retrieved 7 September 2018. ^ The Jordanaires at AllMusic. Retrieved July 15, 2013. ^ Official records, National Academy of Recording Arts & Sciences, 2000–2006. ^ "20th Century Gospel: From Hymns to Blackwood Brothers Tribute to Christian Country - Various Artists - Songs, Reviews, Credits". AllMusic. Retrieved 4 February 2019.